There are several versions of PAS software v3.2 series: 3.207, 3.208, 3.211; 3.215x, 3.221F. The most recent ones are the 3.211 and 3.221, their difference is in the set of instuments. Pulse Analysis System software is intended to get person's health estimation by analysis of pulse waves. Pulse waves are registering by a special sensor, in points on person's arms - cun, guan and chi, according to the Ce-May technique. Searching and sampling of pulse wave (with specified probability) from the continuous pulse series (with specified signal stability). Estimation of sensor positioning quality. Statistical processing and filtering by lengthening series method, which ensures the statistical signal authencticity. 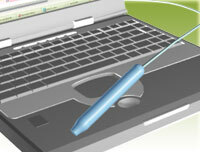 Provides high-speed data processing: complete pulse registration and analysis takes 3-5 minutes. Integrated patients database (details, pulse registrations, history). Qi circulation and Qi deviations - displays the distribution of Elements Qi, and also showing most deformed (deviated from harmony) Elements Qi. Syndromes - describes patient health in terms of Traditional Chinese Medicine. Wu-xing - shows the deformations (deviations from harmony) of Elements Qi in the Wu-Xing scheme. Hexagram - displays the interactions of Yin Qi - Yang Qi, according to the Chinese classical "Book of changes" (Yi-Jing). Signatures - shows the diagrams of Qi energy circulation in channels (showing the damps and defacement of Qi flow). Elements projections - describes the projection (display) of Elements Qi in real world. This can be used in Feng-Shui technique, diets, massages, aromatherapy, physical training, and so on. Health Matrix of Yin channels. Health Matrix of Yang channels. Health ��trix of Elements (summary). "View" menu Selects view of Health Matrix: Elements, Yin, Yang. Stability Sets the relative stability level (level of full compensation of Qi deformations). Zero compensation level Yin - Yang One of the most important parameters. It shows level of harmonic Yin Qi and Yang Qi (relative to 100% - full harmony). In addition, it tells unbalance of Yin and Yang. Cells are showing the deformation (deviation) of Qi from SIN-order (harmony). The more deformation the more deep color it has (Lack-deep blue, Excess-red). Rows are displaying the structure of Qi deformations (in channel) by various type of Qi. Columns are displaying the structure of Element Qi deformation. Balance (column and row) this is a absolute sum of deformations values (example |-1.5| + |1.5| = 3). "Qi circulation" - this window allow to estimate the Qi circulation in channel. Left and Right bars show the real distribution of Qi. Bars colored according to the Elements colors, brighter is the Yang component darker is the Yin component. The dark bar in middle is the SIN-order distribution. "Qi deformation" - this mode displays the deformations of Qi in channel ordered by value. Left and Right bars show the real distribution of Qi. Bars colored according to the Elements colors, brighter is the Yang component darker is the Yin component. The dark bar in middle is the SIN-order distribution. "Syndromes" - describes syndromes in terms of Traditional Chinese Medicine. "Wu-Xing" - displays the Qi deformation in Wu-Xing in each channel. "Hexagram" - displays the interactions of Yin Qi - Yang Qi, according to the Chinese classical "Book of changes" (Yi-Jing). "Signatures" - this mode show the graph of Qi circulation in channel. "Elements projections" - describes the projection (display) of Elements Qi in real world. This mode is used in Feng-Shui technique, diets, massages, aromatherapy, physical training, and so on. For working with PAS it is needed a computer with at least Pentium II CPU, 64 Mb RAM and serial COM port. Supported OS Windows 98/ME, 2000, XP. PAS software is distributing freely, and working without any limitations. However, you will need a PAS sensor for registering pulse. Without sensor you may analyze existing patient records. You can download the software from files page.